Want to know more? 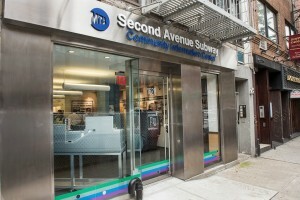 Visit the Second Avenue Subway Community Information Center at 1628 Second Ave.
Quickly navigating New York City’s mass transit system requires time, forethought and good fortune. It is still far cheaper than a taxi and better for the environment. According to the Mayor’s Office of Sustainability 43 percent of New Yorkers travel to work by subway and commuter rail. One particularly vexing problem has been traveling from upper Manhattan’s east side to the lower east side via the underground. Thankfully, the city’s Metropolitan Transportation Authority is nearly done with the first phase of the city’s solution. Namely, the Second Avenue Subway, which will be the first major addition to the serpentine subway system in 50 years. The Wall Street Journal reported that the $4.45 billion project was on schedule, and it is still expected to open in December 2016. Once the dust and schist rock settles, the new line will run along 8.5 miles from 125th Street in Harlem all the way down to Hanover Square, which is in the Financial District and near the South Ferry Terminal. There is an existing subway line that runs up the east side, but to call it overcrowded would be a serious understatement. The transit authority expects a whopping 200,000 daily riders to hop on board once the train line is activated. Using mass transit benefits the goal of improving air quality. When states and cities plan these capital improvements, it’s important that they consider transportation conformity. Transportation conformity is required by the Clean Air Act and basically means that planners should work to not cause new air quality violations or against air quality standards. Well, if all goes according to plan, tears of joy will soon be shed by straphangers all over the city who will soon have a brand new subway route as they navigate the Big Apple.